The Sainik School at Kazhakoottam, Trivandrum which happens to be the Alma Mater of so many of my friends, is observing the Golden Jubilee of its existence this academic year, and the grand finale is scheduled for 21 Jan 2012. 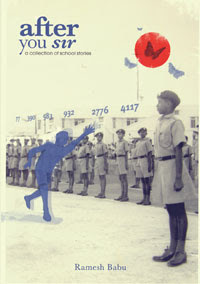 One of the SSKZM alumni has brought out a collection of school stories titled "After You Sir", with a noble intention that reads "All the royalty accrued from the sales of the book is donated to Sainik School to support economically disadvantaged students." - who were once upon a time raw rural lads who left home at the tender age of 10. - who faced the physical vastness of a rather unsophisticated residential school so different from carefree village bylanes. - whose EQ is phenomenal, with their hearts - and minds - in the right place. - who are ever ready to give their all to the Alma Mater.